No fewer than two persons were confirmed dead and six others injured, when a tanker bearing petrol fell at Amawbia Roundabout in Awka and went up in flames on Saturday night. 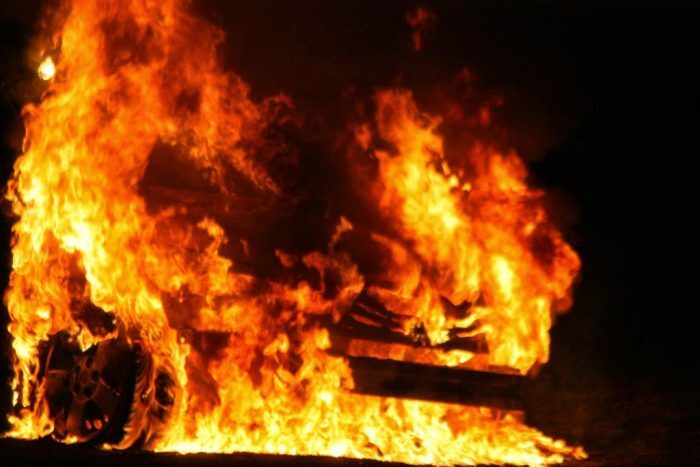 News Agency of Nigeria (NAN) learnt from eyewitnesses that at least eight vehicles and some residential buildings within the vicinity were also destroyed in the inferno. Eyewitness account said that the fire occurred in front of the Amawbia Fire Service and near the Police Headquarters, Anambra Governor’s Lodge and other public buildings. Narrating his experience, one of the victims, Mr Paul Igwemma, whose car got burnt in the fire, said the tanker was negotiating a bend when it fell and subsequently burst into flames. Igwemma, who was full of praises to God, said he had to abandon his vehicle and ran for his dear life. “I saw the vehicle trying to negotiate to this direction and all of a sudden the tank fell and hit the pavement of the roundabout so I immediately out of my car. “Few seconds after, there was an explosion accompanied by fire and as you can see, my car is burnt beyond recognition, together with about ten other vehicles,” he said.